AFR’s 335cc Rectangle Port Powerhouse! Are you looking for big torque and big horsepower number? 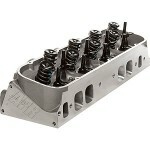 AFR’s BB-Chevy line of medium volume intake runners will provide you with exactly that. The phrase ”having your cake and eating it to” would certainly be appropriate with their moderately sized intake runners producing tremendous flow figures across the entire lift range, this CNC 335 flows 410 CFM! These high flow/high velocity ports provide extreme versatility and fill the needs of many applications. From a max-effort high compression 454-605ci low rpm marine application, either one of these cylinder heads would be a great choice. These heads would also be ideal in a larger cubic inch ”Pro-Street” application with their broad torque range, as well as significant rpm and horsepower capability. These heads will work best with a primary operating range of 3000-7000 rpm’s (This range is an average and will vary with engine displacement as well as component selection). The 335cc comes standard with AFR’s trademark .750” (3/4”) thick head deck, reinforced rocker stud bosses, and are equipped with premium one-piece stainless steel 2.300” intake valves and 1.880” exhaust valves. 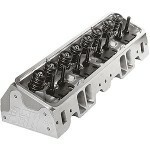 Properly selecting the correct cylinder head for an application depends on a large number of variables. Take note the higher flowing exhaust ports and bolt pattern are raised .375” (3/8”) over stock location, this rarely affects header or chassis fitment. Made in USA.